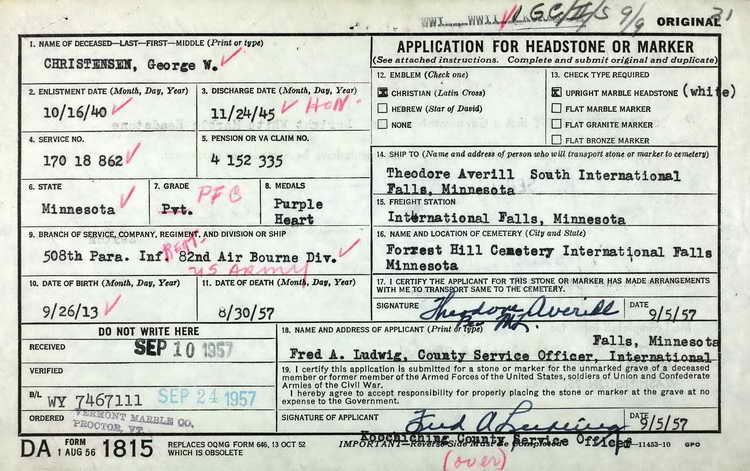 Application for headstone or marker for George W. Christensen to be installed in Plot 3, Section 23 NE, Grave 1/2 in Forest Hill Cemetery , International Falls (Koochiching county), Wisconsin. George enlisted in the Army at Duluth, MN on 16 October 1940 and later volunteered for parachutist duty. Om 10 August 1944 Pvt Christensen was transferred from the 11th Replacement Depot to Hq 1st, 508th PIR. He was listed as slightly injured in action but classed as a battle casualty on 29 December 1944. although hospitalized at the time, he was promoted to Pfc on 4 January 1945. Pfc Christensen rejoined the company on 13 January 1945. But, four months later, on 31 May 1945, Pfc Christensen was again hospitalized and transferred to the Detachment of Patients. He did not return to the regiment. His military decorations include the Combat Infantryman Badge awarded for action during the Belgium Campaign.